My name is Glenn Kardel. I have polyglandular autoimmune syndrome type II, frequently referred to as Schmidt's syndrome. 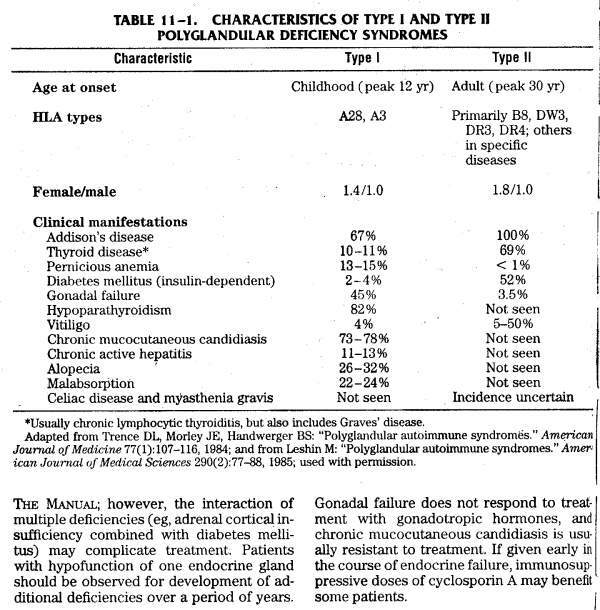 The classic manifestations of this syndrome are adrenal insufficiency plus autoimmune thyroid disease and/or insulin dependent diabetes mellitus. I have all three of the above conditions: Addison's disease, hypothyroidism, and type I diabetes. Addisons and hypothyroidism are treated with oral hormone replacement medications. Type I diabetes is the most serious and difficult to control of the three conditions. Treatment usually involves balancing insulin therapy administered through injections or a pump, diet, and exercise with the goal of maintaining normal blood sugar levels. Having Addison's disease in conjunction with type I diabetes presents a significant additional challenge to maintaining normal blood sugar levels. The adrenal gland plays an important role in controlling blood sugar. It produces a glucocorticoid hormone, cortisol, that causes the liver to release internal stores of glucose and reduce glucose uptake in peripheral cells when blood sugars drop below normal levels. The goal is to counteract the drop in blood sugar. Addison's patients usually take steroids (hydrocortisone, prednisone) to replace the cortisol that's not produced by their adrenal gland. These steroids have a side effect of increasing blood sugar and also don't perfectly mimic the natural action and production cycle of cortisol. The net effect of all of this is that type I diabetics with Addison's disease will experience more variable and extreme blood sugar levels. The patient who isn't prepared to handle these changes in their diabetes will face a very risky situation. After I was diagnosed with Addisons and started taking hydrocortisone, I started to have highly variable blood sugars. I began to have sugars in the 300's and also frequent hypoglycemic episodes. I started searching for information about the interaction between Addisons and diabetes or any special treatment strategies related to the two conditions and was surprised to find almost nothing. Given the adverse and potentially dangerous effect Addisons has on diabetes, this information should be explicitly stated and available to people with Addisons and diabetes. This website is my attempt to provide information on this subject and hopefully connect with others who have useful information about Addisons and diabetes. Provide information about Addison's disease, type I diabetes, and the interaction between the two conditions. Share the techniques I've used to control my diabetes in the face of the added pressure of Addisons. Provide an opportunity for others to share information, experiences, and advice on Addison's disease and diabetes.